Game description: Edda is a young man whose youth is marked by a boring island life, but whose serenity is shattered when he meets a mysterious young woman named Kirika on the beach. He soon realizes his skill as an exorcist and becomes a hunter, weaving a remarkable journey that will ultimately pit civilization against nature. 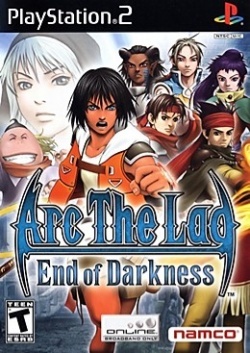 Arc the Lad: End of Darkness is the sequel to Arc the Lad: Twilight of the Spirits. Description: The game has brightness graphical glitch in gsdx hardware mode. It is a minor glitch that doesn't affect the game play. Workaround: GSdx in software mode F9 to get rid of white shadows (SPS=Spikey Polygon Syndrome).